According to the NOAA Coral Reef Watch monitoring system, coral bleaching is likely in the Caribbean in 2010. With temperatures above-average all year, NOAA’s models show a strong potential for bleaching in the southern and southeastern Caribbean through October that could be as severe as in 2005 when over 80 percent of corals bleached and over 40 percent died at many sites across the Caribbean. Scientists are already reporting coral bleaching at several Caribbean sites and severe bleaching has been reported from other parts of the world. The NOAA Coral Reef Watch (CRW) satellite coral bleaching monitoring shows sea surface temperatures continue to remain above-average throughout the wider Caribbean region. Large areas of the southeastern Caribbean Sea are experiencing thermal stress capable of causing coral bleaching. The western Gulf of Mexico and the southern portion of the Bahamas have also experienced significant bleaching thermal stress. The CRW Coral Bleaching Thermal Stress Outlook indicates that the high stress should continue to develop in the southern and southeast Caribbean until mid-October. Prolonged coral bleaching, can lead to coral death and the subsequent loss of coral reef habitats for a range of marine life. The decline and loss of coral reefs has significant social, cultural, economic and ecological impacts on people and communities in the Caribbean, the United States, Australia and throughout the world. As the “rainforests of the sea,” coral reefs provide services estimated to be worth as much as $375 billion globally each year. Even though a variety of stresses — namely thermal stresses — continue to rise in the Caribbean basin, temperatures are expected to begin cooling in the Gulf of Mexico and Florida. In addition, recent hurricanes and tropical storms that passed near the U.S. Virgin Islands have cooled the waters there. NOAA researchers have shown that tropical weather systems can cool the high temperatures that cause bleaching, and NOAA forecasts that this Atlantic hurricane season will probably be more active than usual. 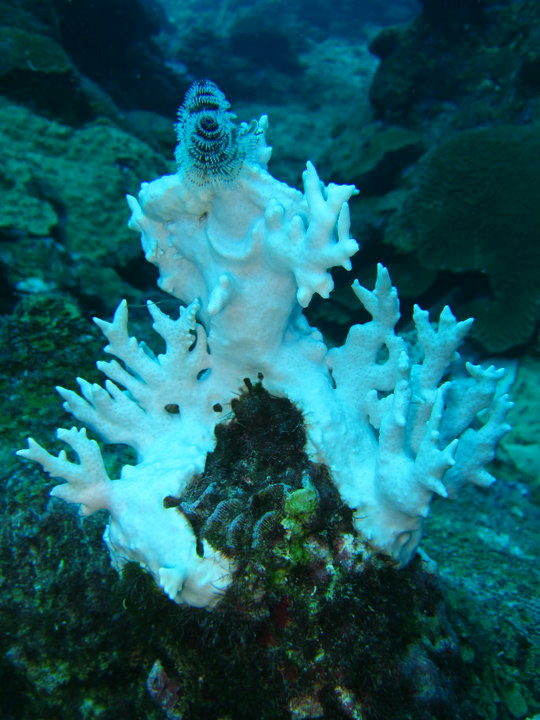 In 2005, the year of the worst bleaching on record in the Caribbean, no tropical storms passed close enough to cool the Virgin Islands, resulting in 90 percent of the area corals being bleached and 60 percent dying. Overall the 2005 bleaching event was the result of the largest, most intense thermal stress recorded in the Caribbean during the 25-year NOAA satellite record. Bleached fire coral and christmas tree worm on top (Flower Gardens Bank bleaching 2010). Posted on April 12, 2011, in Uncategorized. Bookmark the permalink. 1 Comment.